Jamendo is a music platform offering artists the ability to promote, publish, and be paid for their music made available for download under Creative Commons and the Free Art licences. Jamendo is the first site to offer its contributors 50% of revenue gained from advertising. By registering for this optional programme, artists share in the site’s profits according to their page views. In addition, Jamendo offers the ability for users to donate directly to their favourite artists through a PayPal ‘tip jar’ facility. Artists receive close to 100% of moneys donated: a small administrative fee is deducted. This has been the first serious attempt of a file-sharing site to provide a direct way to compensate musicians for their work. Furthermore, by adopting Creative Commons, the site offers the possibility to distribute music freely, while preserving the basic rights of the artist. Mechanisms to make direct donations to the artists through PayPal. By 14 July 2008, Jamendo had significantly increased their offerings, in featuring 10443 albums, 62001 album reviews, and 370283 active members. A nonexclusive platform: the artist remains the owner of their music, which they are free to distribute by any other means at their disposal. Jamendo maintains a strong commitment to complementing traditional music distribution methods, such as CD sales. A zero-cost platform: Jamendo provides hosting for free. Site costs are kept low by using P2P distribution. Minimal advertising is included on the site and included in audio streams to raise revenue. A free platform: Artists reserve the right to remove their content from the site at any point, and are thus not prevented from signing exclusive contracts with record companies. spreading the word about Jamendo: the more popular the site, the greater the hit count and thus the greater the revenue. On 29 October 2007, economist Aaron Schiff from 26econ.com wrote on the progress of voluntary donations on Jamendo, providing statistics as follows, in addition to the Excel file of the data. This sits alongside Jamendo’s donation statistics. 5. Although the site has yet to produce a lot of revenue, it does so without DRM. This may cause difficulties in verification. Jamendo’s entire catalogue is available for free download, being licensed variously under Creative Commons or (less commonly) the Free Art Licence, the English-language version of the Licence Art Libre, a French copyleft licence applying to works of art. In addition, each artist’s profile clearly details their licence terms under the ‘Your rights on this album’ section, linking to the relevant Creative Commons deed. 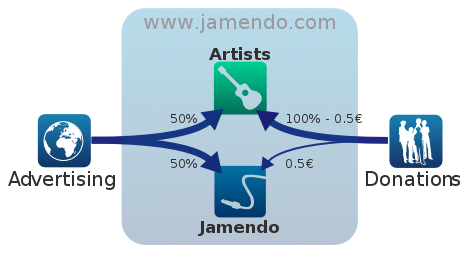 Jamendo allows artists to distribute their work across peer-to-peer networks via legally-recognised means. The site harnesses the power of the Internet for rapid recognition of talent, and rewards the artist for their work through fair compensation mechanisms. In adopting Creative Commons, the site offers the possibility to distribute music freely, while preserving the basic rights of the artist. The flexibility of the licenses that let the artist choose 'how free' they want their music to be. The clarity of the "human-readable" license page and the quality of the "machine-readable" and "lawyer-readable" license pages. As to users’ individual motivations to license under CC, Dailymotion, a Paris-based video-sharing site, recently called upon Jamendo’s artists and users to provide testimonials and anecdotes of their experience with the site. Jamendo has implemented 1) a license chooser; 2) the license mark on pages for CC licensed tracks and albums; 3) CC REL metadata; and 4) searching for CC licensed tracks. 1. After registering an account, select Upload your album from the top menu, which will start the upload process. Upload your album's tracks. In the example below, a track named "Test" was uploaded. 2. Finish uploading your album's tracks, following all directions on the page. When done, continue to the Write an album description page. 3. At the bottom of this album description page, you should be able to select Creative Commons license options. Select your desired options and continue with the upload process. The Creative Commons license mark appears on CC-licensed album pages in the right hand column along with explicit indicators of license restrictions. Jamendo has implemented a subset of the CC REL specification by adding rel="license" tags into links to the CC license deeds. They chose to specify the cc namespace in the leading tag, but strictly speaking this isn't necessary; "license" in CC REL has been defined as equivalent to "license" in the xhtml vocabulary (which doesn't require an explicit inline namespace declaration). You can search and browse CC licensed works by going to the Creative Commons page. Delete this line and add text here. Add media that is relevant. This page was last edited on 16 December 2010, at 20:49.